Caution. Wild ideas ahead. The farther down the page, the wilder they get. By “pace of time” I mean how fast time seems to be passing. It is widely presumed that the pace of time is a universal constant; that time marches along at a constant pace from the beginning of time to the distant future. I don’t think so. The pace of time varies. It depends on the perspective of who is experiencing it. The pace of time is relative. Me and other humans have a similar pace of time. We are relatively similar to each other. We share the same clock: the rotation of the earth around the sun and the spinning of the earth relative to the sun. This is how we measure years and days. For me, a lot of stuff happened this day. Many things moved and transformed before my very eyes. I interacted with people. I metabolized food and converted it to energy. I burned energy that I had stored and converted into laughter. It was a good day. What happened in the day of the granite mountain that I am sitting on? This solid ledge along the Maine coast? Looks like not much! I have been hustling and bustling about country roads and city buildings, turning food into energy, building things and burning things and buying things and all the while this rock has done absolutely nothing. Well, that’s what it looks like relative to my definition of a day. But isn’t it presumptuous of me to apply my definition of a day to a judgment that I make about the mountain? Perhaps the mountain experiences a different pace of time, a different length of “day.” Perhaps a day for me was like a nanosecond for the mountain. And of course the mountain didn’t do much in one of its nanoseconds. I didn’t do much in one of my nanoseconds today either! The standard method of setting the pace of time for humans is to establish the year 1900 as the baseline when we know that it took 31,000,000 seconds for us all to experience that one year. In 1900 it took 31,000,000 seconds for the earth to travel once around the sun. We then establish measurement scales longer (decades, centuries, millennia, eons) and shorter (months, days, minutes, seconds) based on that pace. But “that pace” is based on something external to each one of us, something “out there;” the time it took for one celestial body to orbit another, once. It’s supposed to be a standard that is external to us all and applicable to us all. Humans love standards like this! We are always naming “universal rules” and “laws of god” and “absolute truths.” There’s always someone trying to reach to the heavens and invoke some higher order for us all to live by. But what if we didn’t believe in absolute truths or universal standards. How then would we measure the pace of time? It would have to be a unit of measure unique to each person, each thing. How about one’s “lifetime?” Interesting combination of the words “life” and “time,” isn’t it? Yes, I think they are connected. So perhaps one’s pace of time – the pace at which time seems to be passing for any creature – is relative to the time of it’s life, it’s duration, it’s lifetime. This is a provocative idea. For one thing, it would mean that the pace of time is variable; that it is different for all creatures and not a universal constant. For another thing, it would mean that in order to consider the pace of time of the mountain that I am sitting on, I would need to consider that the mountain has a lifetime, that it has a life. Well, what if this piece of ledge on the Maine coast, this hunk of the earth’s mantle, is actually part of a giant living creature that is so different from me in size and pace of time that I don’t perceive it as living? What if this mountain is part of a living creature vastly older and slower than me? The rock on which I sit seems very still, even dead, for the time during which we cross paths. That’s how it seems to me. But if the mountain has a lifetime, say, a million times longer than mine than our moment together was a million times shorter for the mountain than it was for me. The mountain didn’t even notice me. And to me, the mountain seems inanimate. Perhaps me and the mountain have extremely poor understanding of each other not because one of us is alive and one of us is dead (according to some universal standard) or not because one of us moves fast and one of us moves slow (according to some universal standard) but simply because we live at extremely different paces of time. Instead of presuming that the mountain is dead simply because I can’t understand how it could be alive, perhaps it’s just that I can’t understand how it can be alive. Because we exist at vastly different scales and vastly different paces of time, our ability to understand each other is vastly diminished. And it is human nature that when we can’t understand things we make stuff up. We presume things. We can’t stand it when we can’t understand so we make up assumptions to provide grounding. Perhaps that some things are alive and some things are dead is such an assumption. Perhaps that the pace of time is constant for all things is such an assumption. While I am quite sure that the pace of time is relative among all things and not a constant for all things, I am not quite sure how to measure its relativity. I’m not sure how to measure the pace of time of one thing in order to compare it to the pace of time of another thing. Above I discussed the notion of relative lifetimes; that the pace of time is relatively faster for things with short lifetimes and relatively slower for things with long lifetimes. The idea is that I pack roughly the same amount of stuff into 70 years that the mountain packs into a million years. And a bug packs a whole lifetime into 5 days. Perhaps the duration of one’s life is an indication of one’s relative pace of time. Similar to the average lifetime of a species, relative pace of time across species might be represented by the species’ “regeneration rate;” the average rate at which new generations are created. Just an idea. Here’s another idea. Perhaps one’s pace of time is related to one’s size. Really big things (relative to me) like mountains and planets and galaxies have proportionally slow paces of time (relative to me). And similarly, really small things (relative to me) have proportionally faster paces of time (relative to me). And here’s another idea. This one takes a little explaining. My Theory of Relative Understanding asks that we consider how far apart from each other two things are in space AND that we consider how different they are in volume. How far apart two things are in space is measured by the length of a single straight line between them, measured in meters. And the volume of a thing is measured by multiplying it’s three dimensions – length, width, and height – in meters. 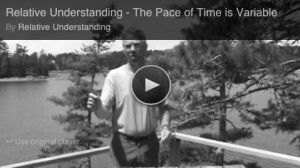 So too the Theory of Relative Understanding asks that we consider how far apart from each other two things are in time AND that we consider how different they are in “pace of time.” Perhaps “pace of time” is to time what volume is to distance. Could there be a parallel? The physical size of something is an indication of how much space it takes up. Could the “chronological size” of something be an indication of how much time it takes up? In addition to time existing in a straight line, like distance, could it have a volume? Could it be that what I have been calling the “pace of time” should more aptly be called “volume of time,” or perhaps a new word altogether? And here’s another idea. Instead of time being a great conveyer belt that carries all things at a uniform pace from past to present, perhaps time is actually generated by things. As a creature is born and grows it actually generates time. The bigger it gets spatially (the more space it occupies), the bigger it gets chronologically (the more time it occupies). Things don’t take time, they make time. And where there is no thing, like perhaps in the dark matter of the universe, there is no time. If we believe that in order for a thing to exist it must exist in both space and time, might it follow that where a thing does not exist there is no time? The conventional belief is that time exists and that things “occupy it” as they come to life and die. But perhaps it’s the other way around: perhaps things exist and create time as they come to life and die. Even wilder idea: perhaps my “pace of time” depends on the rate at which I am growing or dying, creating or degenerating. Thank you for indulging in some of my wildest ideas. I have been thinking about the nature of time for a long time and it feels good to send some of these ideas out into the world. And clearly, there’s a lot I don’t know. Still, although I am puzzled by the nature of time and can’t figure out how to measure its relative “pace” or “volume,” I feel quite confident that it must be relative among all things and not a constant for all things. And if time really does pass at different paces for different things, and not at a constant pace for all things as presumed, it would account for many, many misunderstandings. It would explain why so much about our universe is unexplainable. In addition to all the other challenges we face when we try to understand things, we would have to contend with variable pace of time. Perhaps the daunting challenge of having to deal with that complexity is a reason why have conveniently settled for the notion that the passage of time is a constant.